Pronounced ….. “oo rah pan” …. 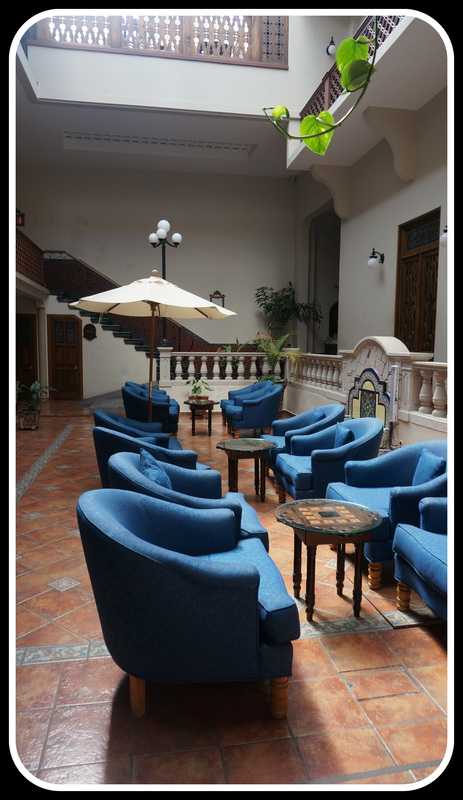 We took a bus from Zihuatenajo here yesterday morning, and checked into Hotel Mi Solar, a beautiful old hotel built in the early 1940’s to accommodate all the tourists flooding into town to view the site of the newly erupted Volcan Paricutin. 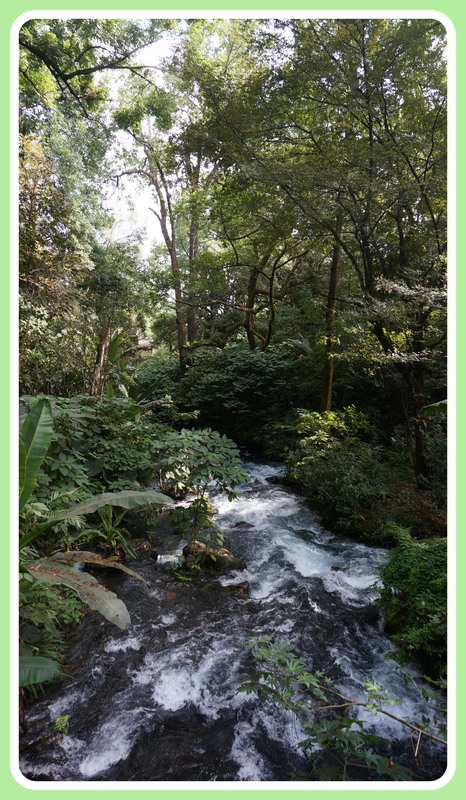 Uruapan has a couple of other qualities that make it worth a visit – namely the location of the primary avocado growing! Lining the roads are avocado orchards (groves??) everywhere you look. Some of the trees are so massive I don’t understand how they harvest them. 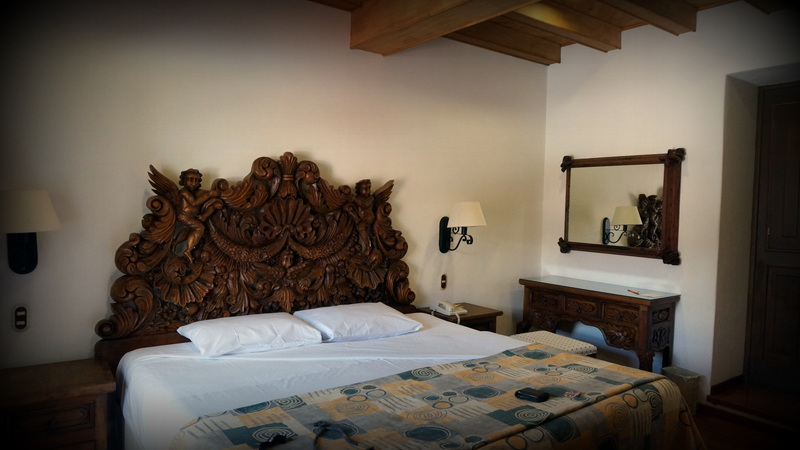 The next big claim to fame here is Parque Nacional Barranca del Cupatizio – an absolutely enormous natural park in the midst of the city. 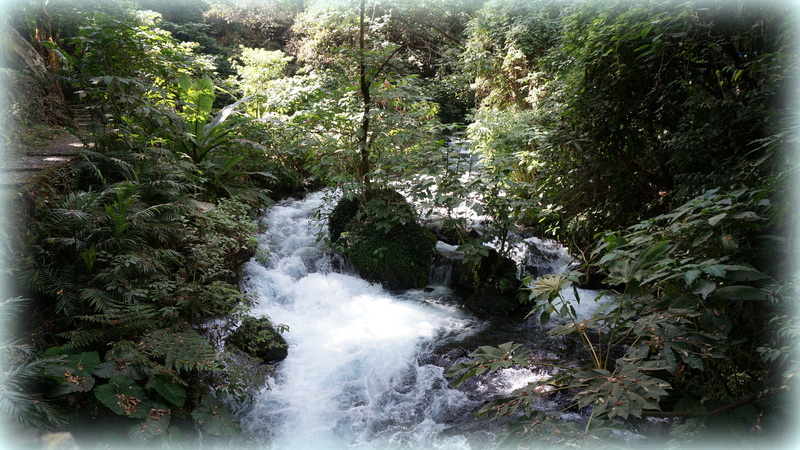 Waterfalls cascade over boulders and down hillsides in an amazing array of waterfalls. 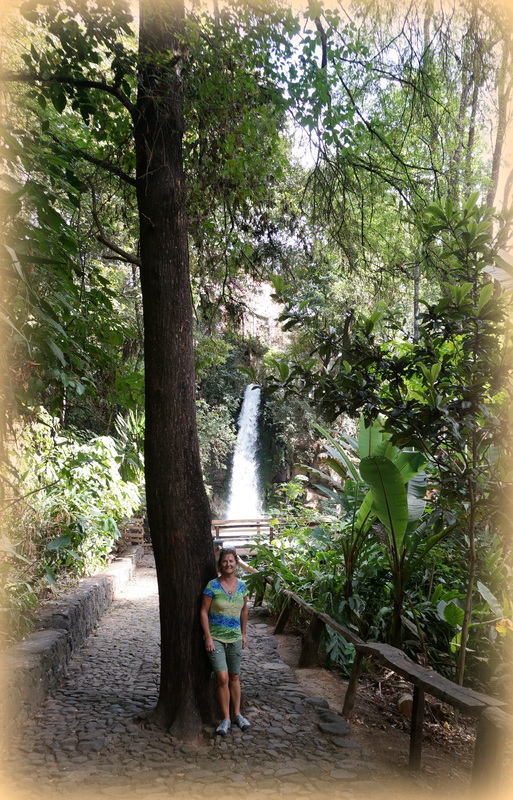 They have also constructed many areas for water falls to allow different paths and it is so beautiful. 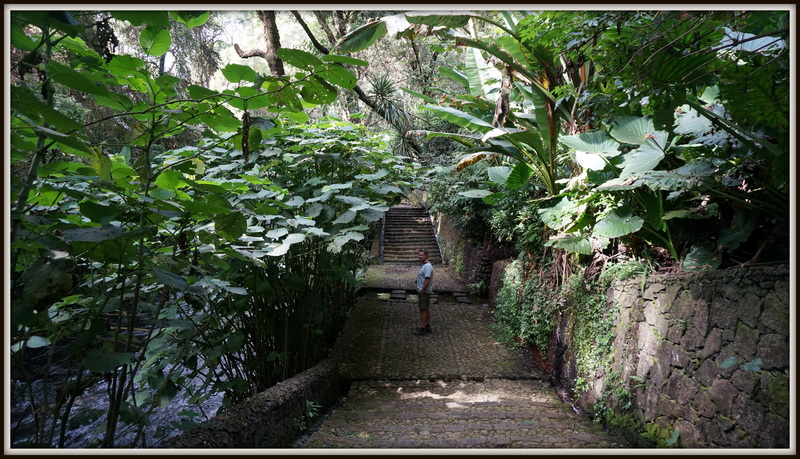 Very lush and jungle like in the park, many cobbled paths to walk along with a multitude of birds and butterflies. We spent about an hour wandering around and just loved it. This is definitely a poor area of Mexico – we have never seen such an amount of graffiti, and vacant buildings just waiting to crumble. Yesterday we did spot a couple of Gringos – but not today. I think few venture into this region. Today we hopped onto a bus again, to go tour the area of the volcano. This is actually the only known volcano to have erupted while being witnessed. Some poor guy was going about his business in 1943 – just tilling his field (by hand of course) and a bit of his field started to quake, spit bits of fire and steam. He tried to put it out himself but soon realized the futility of it as it just kept growing. Thankfully he alerted the residents of the village and once they realized what was happening, and that they couldn’t control it – the village and the next village both evacuated with haste, taking all their belongings. The volcano erupted for 9 years, and within the first year grew to a height of 410 meters. 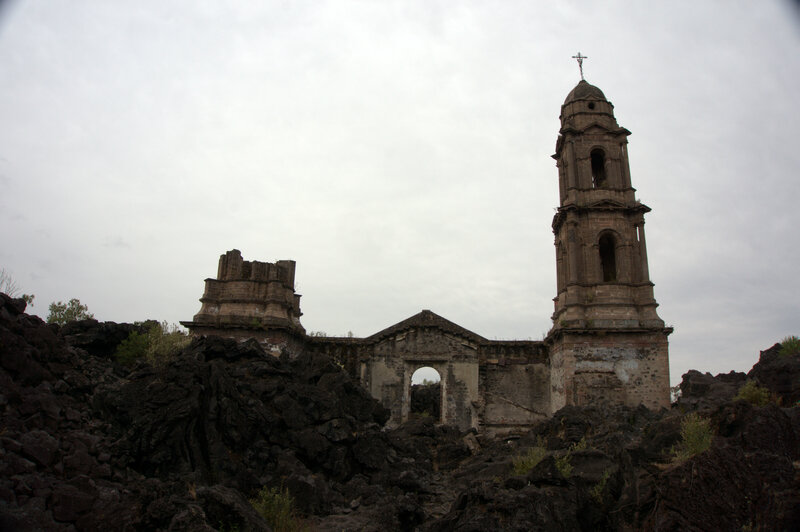 During this time the lava flow completely obliterated both villages and left only the upper portion of a church uncovered. 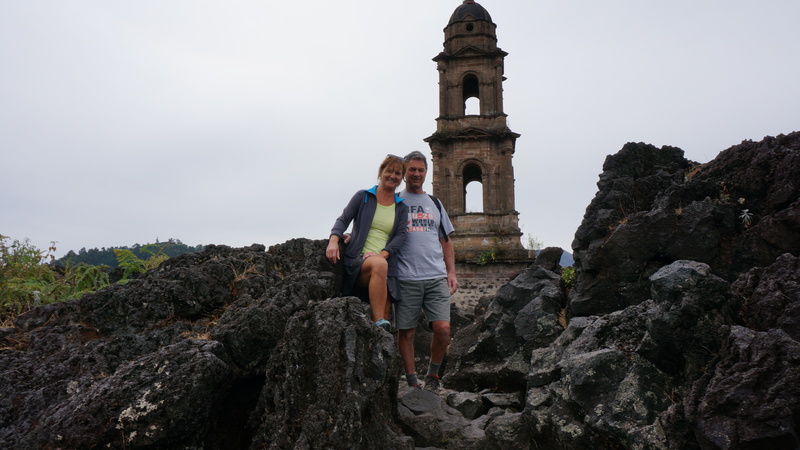 After the bus trip, and the long walk to the base of the climb, I was pretty lucky to find some banos …. Hmmmmm … was I lucky to have found banos …?? 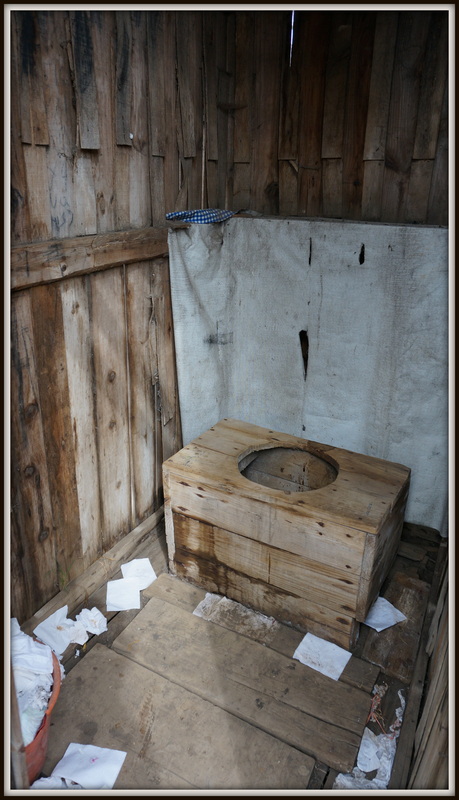 The town of Angahuan is the closest to the church and where we went to go tour the area. As soon as we got off the bus we were met by a couple of caballeros (cowboys) with horses trying to talk us into taking a tour. Somehow the idea of a minimum of 6 hours on horseback did not appeal to either of us. 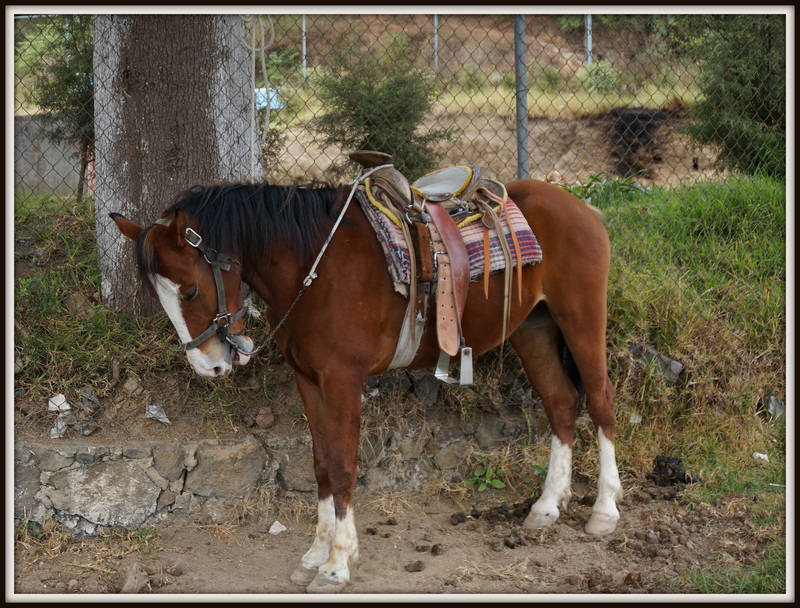 A person just needs to be conditioned for riding in order to do that – particularly given that those saddles may be polished enough to look like leather but they are in fact wood! Eventually one guy talked us into letting him guide us for 150 pesos. I am not sure we really needed him, we could have found our way on our own, but he did speak some English and it is always interesting to learn about a village. This village of 12,000 still speaks their native indian language, along with spanish. 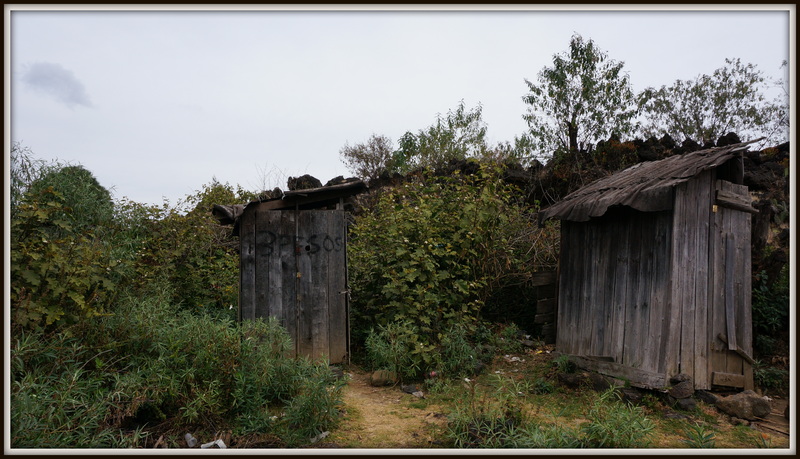 We thought Uruapan was poor, but this is really a poor village. We weren’t sure if it was prosperous at one time because there seemed to be evidence of larger buildings. 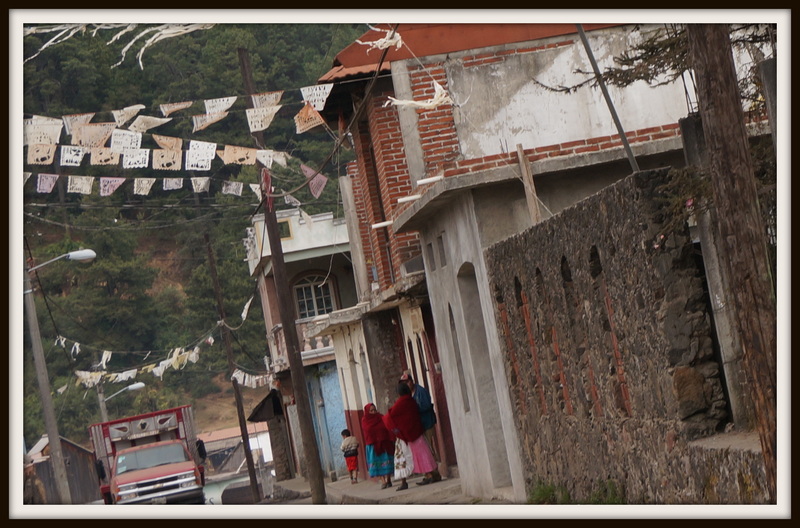 All dirt streets or cobblestone, most people get around by old trucks or horseback. Women and children walk everywhere, with all the women still dressed in the traditional fashion, which is very colourful and elaborate. Needless to say I did try to get some photos, but it just isn’t easy to do when in stealth mode. 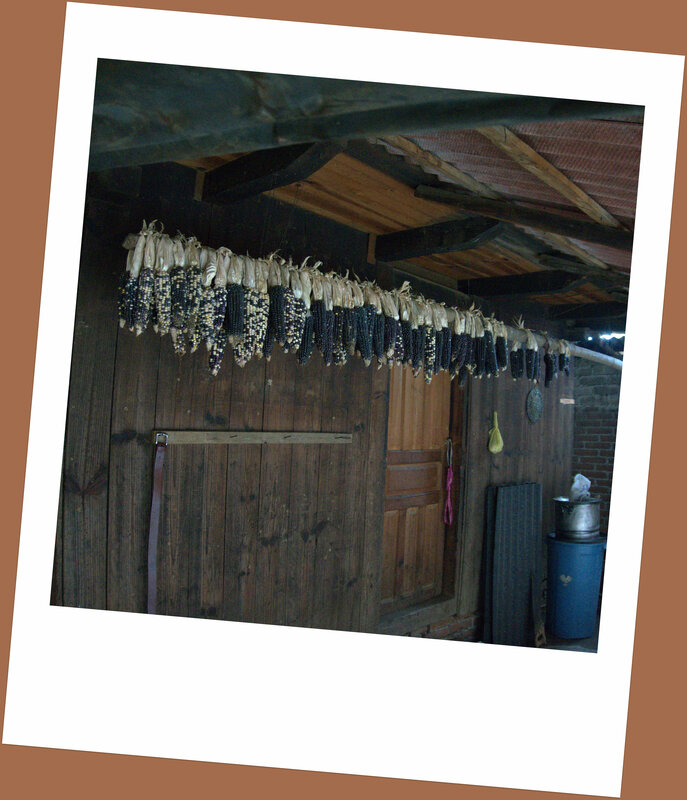 We went into one village home – hard to see across the room with wood used for heat as well as cooking and poor ventilation – blue corn hanging everywhere to dry. Jesus, our guide, took us on the 1 hour hike to the base of the lava, over a wide path that manages either trucks, horses or the odd walker (and believe me we were considered odd). The path may be wide but it sure wasn’t easy. 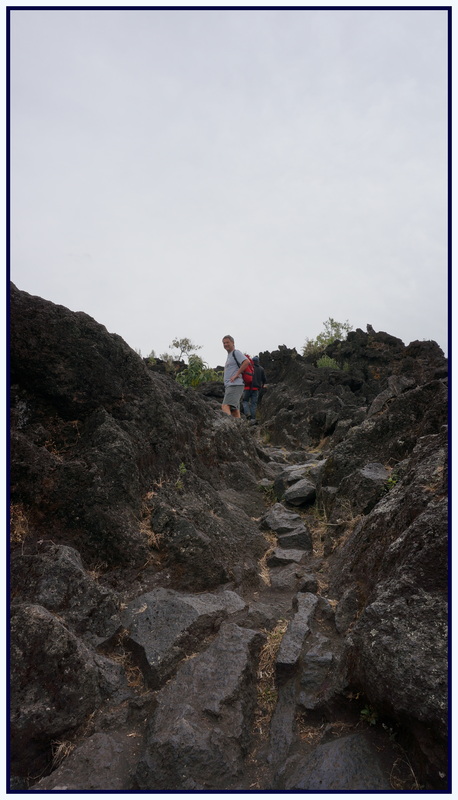 I couldn’t decide if it was tougher trying to walk on the lava stone cobblestones which were very jagged and uneven or the lava sand that was literally like walking on a black sandy beach either up or down hill. We made our way through that to the area where you can see the church as it remains. Apparently the lava stopped right at the altar! It was quite amazing to see – and you can see the top of the volcanoes right behind the churches. Eventually there were 2 volcanoes erupting, one spewing lava and one spewing ash. 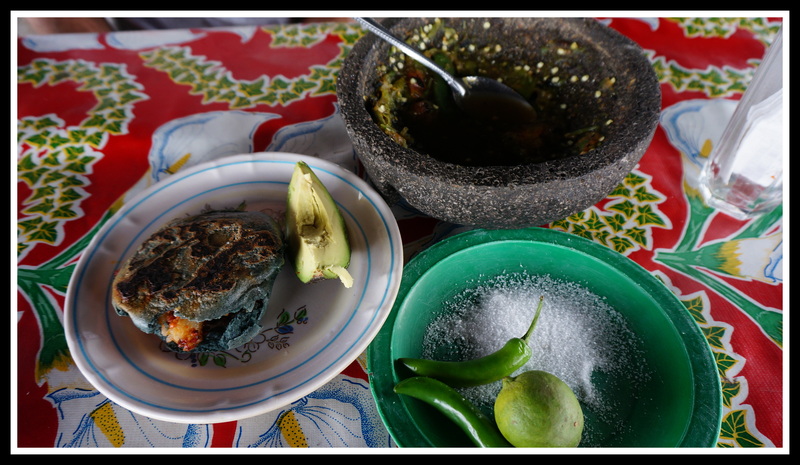 After making our way down to the base we had a blue corn gordita, which was delicious and then started our hike back to the village. 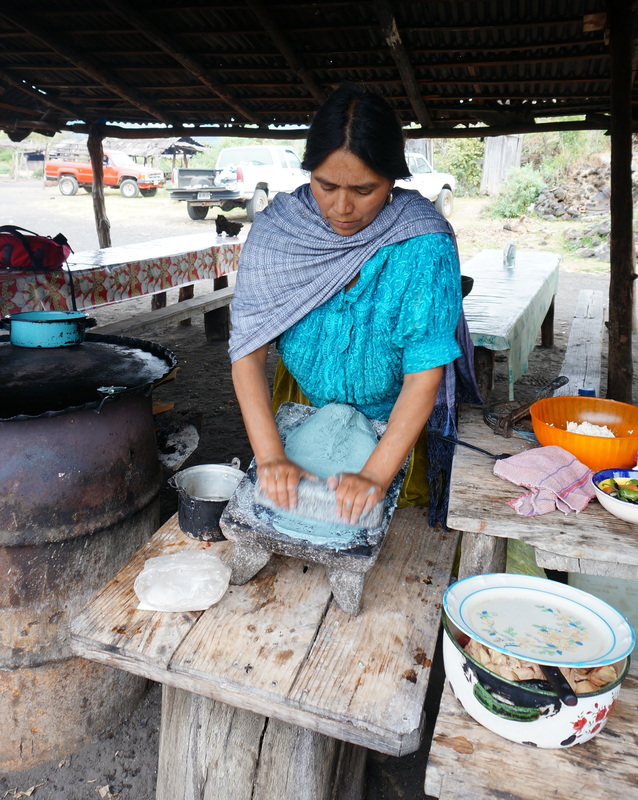 Maria, making us gorditas from blue corn flour – traditional methods and traditional clothing used in this village. 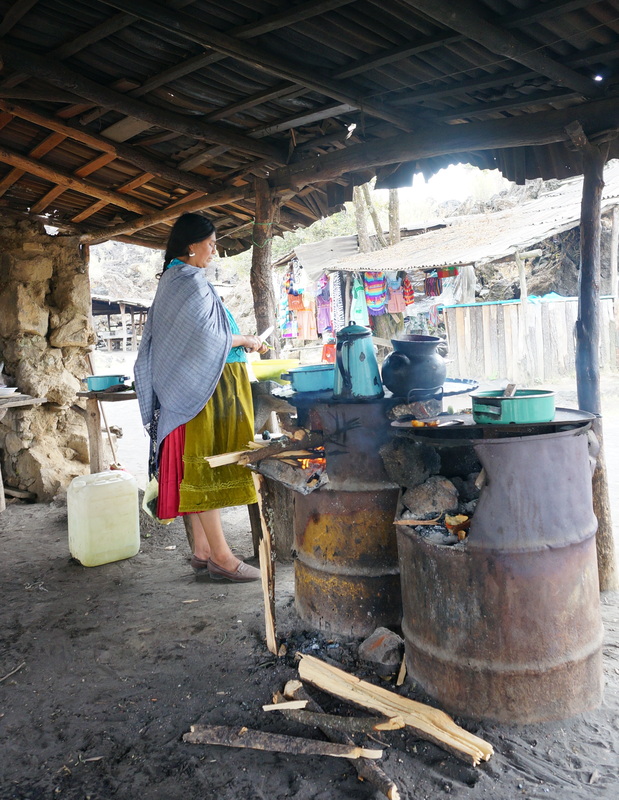 Quite the stove set up Maria has ….. and no cutting board, just cut everything right into her hand and then the pot. As we got through the village and close to the highway we saw the bus pull away ….. meaning just sitting there to wait for the next bus and that is always a questionable idea. Within minutes a collectivo came along – a van type bus that people just pile in and out of. We were able to fit in, and thus began our most harrowing drive of this trip ….. speed limits being mere suggestions and all of this over crazy winding roads. At one point he even moved over to the right (in a 40k zone) in order to go PAST 2 police trucks at 80 k!! Before we knew it, the little adorable snotty nosed sleeping 2 year old girl in the seat next to mine started doing a familiar sounding cough ….. obviously the next step was listening to her vomit. Grant convinced the guys up front to open the window and for the rest of the trip to town I practiced “mind over matter” in an effort to not do the same. I can handle all sorts of crap, but that is not one of them. I was afraid the guy behind the little girl might start next as he started to do that kind of cough thing but he held onto it. 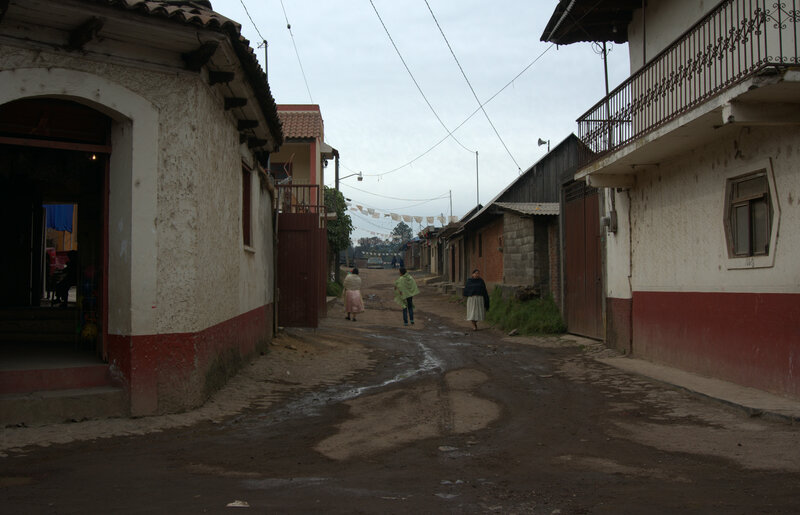 Once we were out of the van I was so happy to be walking – stepped into the first bodega and bought a bag of lime chips and then we headed to a tea shop for a bracing cup of manzanillo tea. Whew. 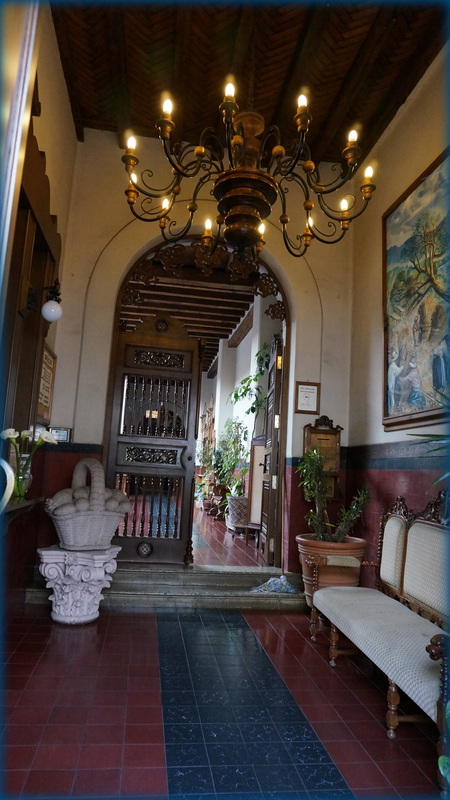 Tomorrow we are headed for Patzcuaro, and staying at an AirBNB place where hopefully I can do a little cooking and we can get our clothes laundered as well.